A vital part of keeping fit and healthy in any sport is stretching. This is all too often neglected. In a haste to get on to the course, court, pitch, ring or multitude of other sporting arenas, players simply forget or think of stretching as an unnecessary time consumption. This could not be further from the truth. By not stretching adequately, you are greatly increasing the likelihood you will suffer an injury. Statistics show that those who fail to perform stretches suffer increased muscle soreness and potential for injury. The reason warming up before golfing is two fold. First, during a golf swing, huge pressure is being exerted on the body and a range of muscles which may otherwise be static in daily life. Therefore, it is even more important to loosen these muscles before stepping out on to the course. Second, golf is a sport dominated by older men and women. As our bodies age, it becomes more important to warm up and stretch before activity. Not surprisingly, the most common golf injuries occur from the hips up. So with that in mind we're going to pay special attention to those areas when warming up. There are many stretches which you can conduct prior to starting a round of golf to help relieve muscle tension and increase flexibility. Not only will these stretches help to reduce the chances of injury, they will also help you swing freely and give you the best chance of shooting a low round. Adopting a square stance with your feet shoulder width apart. Lean forward slightly with your knees bent a little as if assuming a squatting position. Rotate your upper body to the left and right, attempting to move the club as far forward as possible on each side. Repeat this exercise until you have completed 25 reps on each side. Do not perform this exercise if you have a history of osteoporosis or long term corticosteroid use! This exercise will serve to loosen up your core and lower back muscles. You will likely feel some light tweaks and cracks as you perform the exercise. Begin by standing with your feet shoulder width apart. Rotate your right arm in a full slow circular motion, keeping it outstretched and perpendicular to your body. Repeat this motion on the left arm. Attempt to complete 50 rotations on each arm. This simple exercise will greatly help loosen your shoulders and keep any niggling injuries at bay. With your shoulders relaxed, slowly pull one arm across your chest with the opposite hand holding at the upper arm. Pull the arm over as far as possible until you feel a good stretch in the rear of the shoulder. Hold this position for 20 seconds before repeating on the other side. This exercise focusing in stretching your posterior deltoid and is another great way to ensure that your shoulders are thoroughly stretched out and free of tension, helping reduce your injury risk on the course. Stand tall and square with your feet together. Raise one leg behind your body and raise it further with your hand clasping the foot. Bring this back leg as close as possible to the buttocks whilst holding position with your standing leg. Hold this stretch for 30 seconds before repeating on the opposite leg. With this exercise you should feel a stretch in the quadriceps muscle. This will help relieve tension in the knee joint as well as increasing the strength of your standing leg, vital to maintaining stability during your swing motion. Extend your arm straight in front of your body with the palm facing away from you. Using your other hand, pull back the fingers of your outstretched arm until you feel a stretch in your wrist. Hold this position for 20 seconds before repeating on the opposite side. This stretch will help loosen up your wrists, key to preventing hand or wrist problems when swinging. It will also serve as a measure to reduce the possibility of carpal tunnel syndrome which develops in many golfers due to the repetitive motion and club vibrations transferring into the wrist after ball contact. Rotate your left arm away from your body twist your upper half. Let your gaze follow your left hand. Pause at the top for 5 - 10 seconds before slowly dropping your left arm back down and returning to a base lunge. Repeat on the other side. This stretch will help loosen up your lower and upper back muscles. It also will engage your core and stabilizer muscles preparing them to swing a club. *If you're strong enough keep your back leg off of the ground. This will help activate the core. If you have adequate shoulder mobility you should be able to do this with your driver. If not, use an exercise band like this. Hold your driver (or band) by the handle and the bottom of the shaft, perpendicular to the ground. 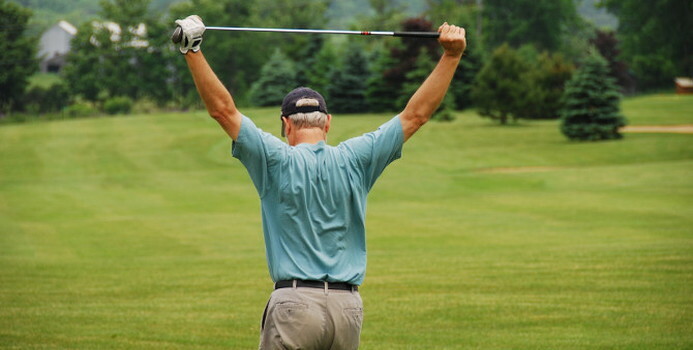 Keep your arms straight and lift the club over your head all down to the other side. If you get stuck at the top you need to widen your grip. If it's too easy narrow your grip. Never force it, if it feels tight widen your grip. This exercise is going to help you restore your shoulder's natural range of motion. Increasing your shoulder range of motion is going to improve your ability to rotate and get through the ball with power. Lying on your back, place both feet on the ground with your knees bent at 90 degrees. Pick up your right leg and cross it over your left leg. You should end up in ​this position. Instead of simply pushing on your right knee, bring your knee in and out by rotating your hips. Perform 15-20 pulses on each side. At the end, use your hand to push and hold your right leg out to really get a solid stretch. This exercise is going to get your hips primed to rotate, instead of sliding which is critical for generating power. 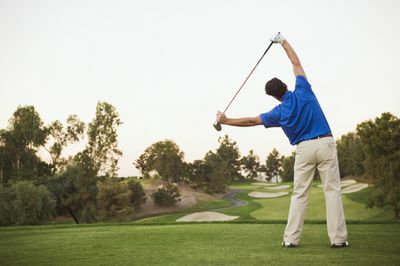 We can clearly see that although there are a variety of stretching exercises available to golfers and other athletes alike, it is key not to adopt a one-dimensional approach to stretching. We need to ensure that every key joint and muscle group is targeted. Many tend to overlook thorough stretching, especially prior to exercise. This complacency can bear a cost in future pain, at the very minimum, athletes would certainly suffer from delayed onset muscular soreness. This can be combated by developing an effective stretching routine. Even more importantly in the recovery and rehabilitation phase, we can see that not only stretching, but muscle strengthening is of paramount importance for preventing recurrence. Given the knowledge and advanced techniques at our disposal, it is important to heed the facts and dedicate some additional time at the beginning of the round to performing a complete stretching routine. Not only will your injury risk be reduced but your muscle tension will be relieved allowing you to swing with greater freedom.